After a relaxing night in the Zulu village we are off to the next adventure. 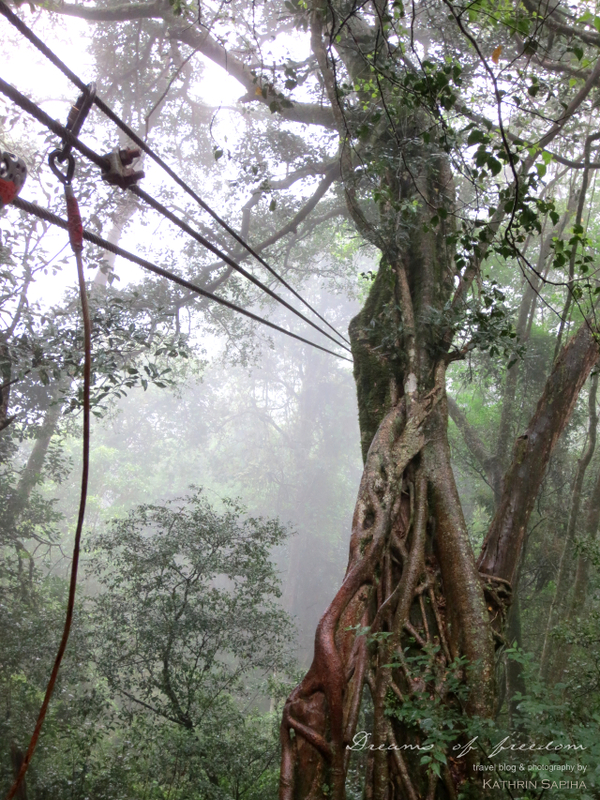 I’m going to defy death while zip-lining from tree to tree. 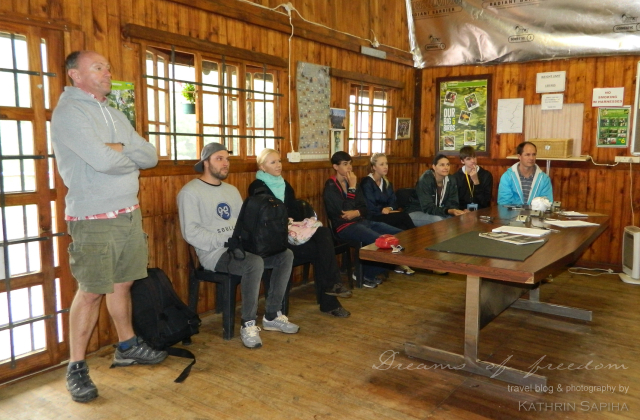 First of all the safety precautions will be explained to the group. After that everyone get’s lashed into their harness and we jump into a pick up truck to be driven uphill to the starting point. A few more steps and we can start. The “rain forest” is living up to it’s name. It’s pouring! We have reached the first platform and I’m a little scared. 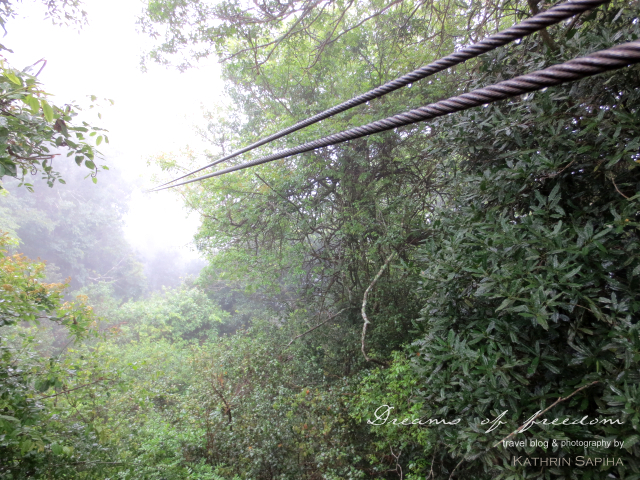 2 long steel cables are suspended over 98 feet (30 meters) above the forest ground and vanish into nowhere. Because of the weather, the sight is limited and I can see how the first members of the group are disappearing into the haze. Then it’s my turn. My carabiners are connected to the cables and I can’t back down anymore. Lifting up my feet and there I go full speed through the jungle! With thick leather gloves I’m holding on and towards the end of the ride I am supposed to slow down a little. I’m rushing past treetops and catch a glimpse of the forest that is hiding behind the mist. It feels weird not to have solid ground under my feet and yet I am feeling intoxicated. The ride is over pretty quick and on the other side busy helpers are waiting for me and taking care that everyone arrives safely and is connected to the platform or the wire at any time. So it goes from tree to tree. 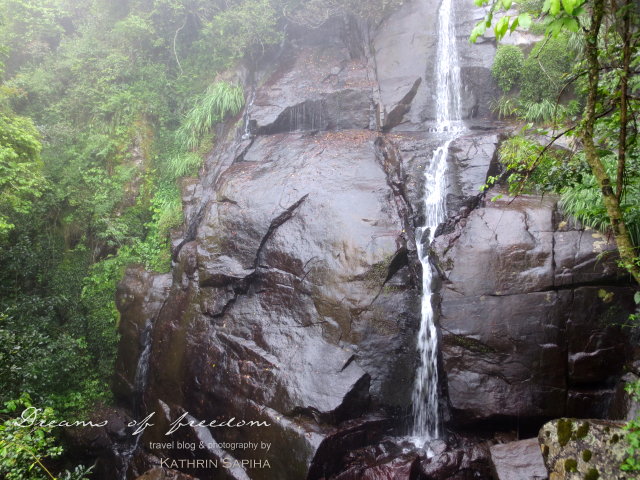 Over distances from up to 200 yards (180 meters), we are passing branches and tropical waterfalls. What a ride! From the last platform we can reach the ground and are making our way back to the main building. 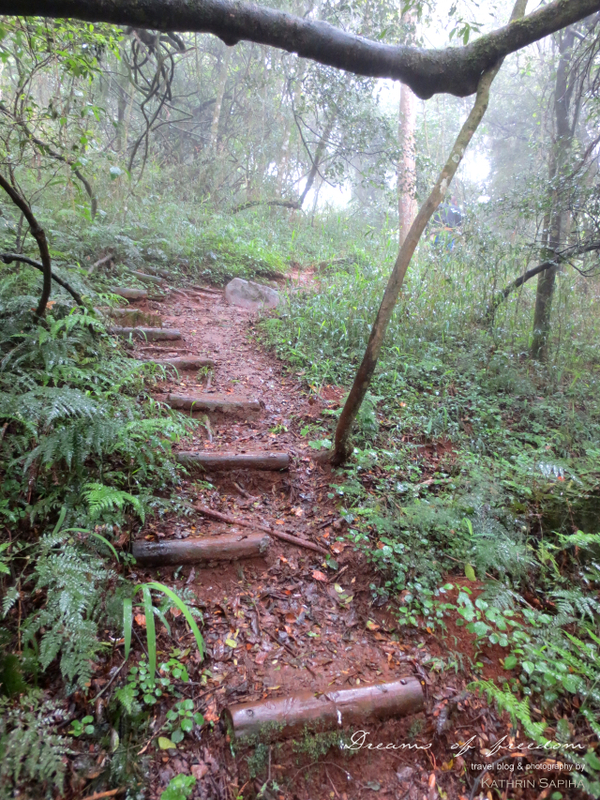 The earth is slippery from all the rain and I have to be careful not to fall. I’m so glad to have dry clothes in the car. Due to the rain none of us made it back dry. After a light lunch we are headed to Durban. After a hot pizza and a good glass of wine I am falling into my comfy hotel bed, knowing I have to get up early the next morning. 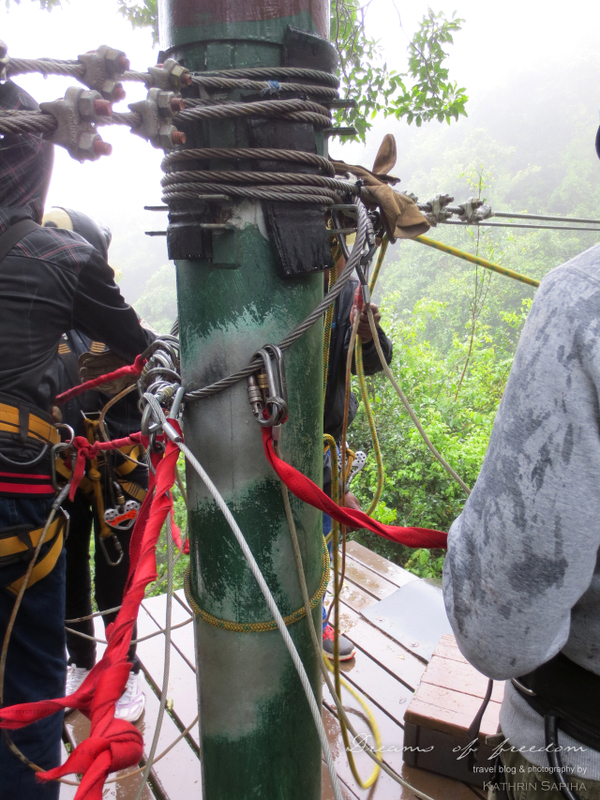 Is zip-lining something for you? Or did you try it already? When and where did you go on this adventure? Would you do it again? I would! Leave me a comment, I’m looking forward to reading your story! It sounds like a fun experience. I have not done it yet and hope I can try it out on my next trips somewehere in Australia. South Africa is definitely on my must-visit list, and I’m a total sucker for adventure travel. 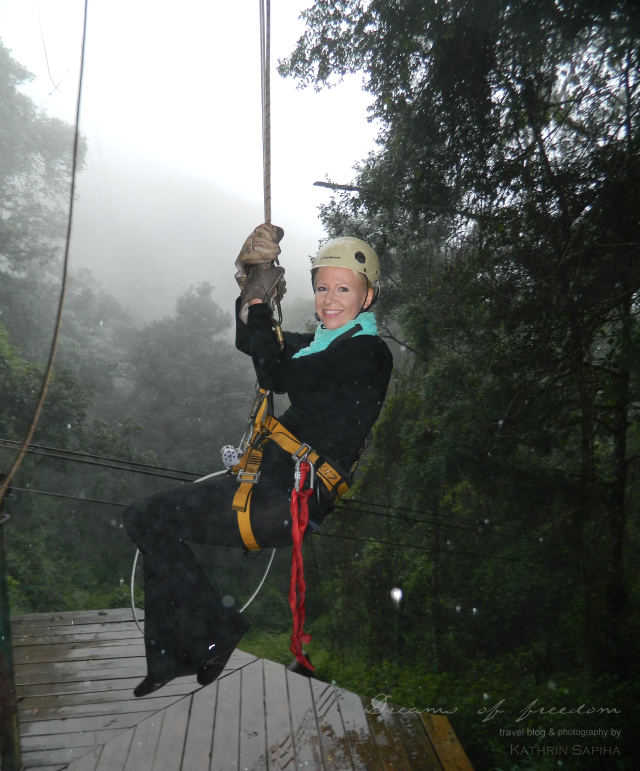 This post has convinced me I need to go zip lining through the rainforest! I’ve actually been zip lining once before. It was with my family in Florida. I enjoyed it the first time, and I’m sure being in South Africa would make it all the more fun. 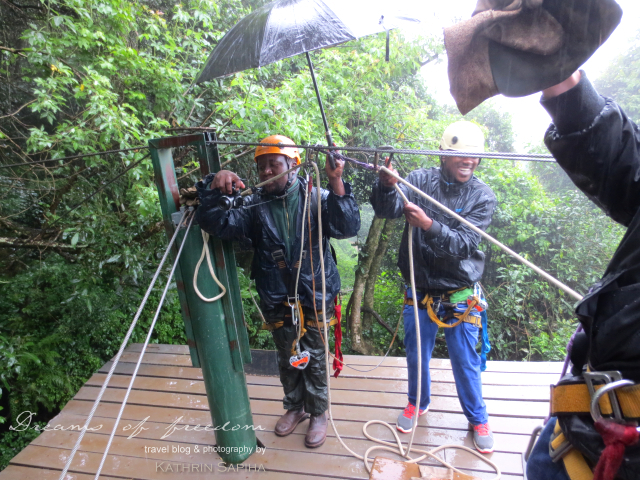 Looks like great fun, esp with the rain/mist – ziplining into the unknown!